A Derby Coffee Can. London Shape Handle . c.1820. 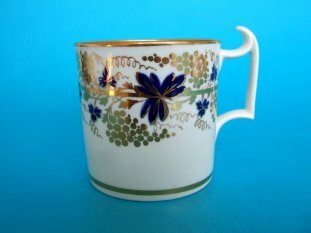 A Derby porcelain coffee can with London shape handle dating from c.1815-25. Decorated in underglaze blue and gilt with grapes and vines. Marked in red enamel. Measures 6.6cm (2.65 inches) diameter at the rim and 7cm. (2.75 inches) high. Good, no chips or cracks. Typical Derby (at this period) crazing to the glaze but there is no staining. Very minor wear to the gilding. An English Blue & White Plate. An English blue and white hand painted plate. Masons ? 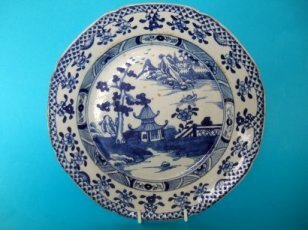 An early 19th.Century English plate, hand painted in underglaze blue with Chinese export porcelain style pattern. The plate was probably made as a replacement or addition to a Chinese export service made around 1770. In the early 19th.Century Miles Mason advertised in the London Morning Herald that he could make pieces to match existing services. 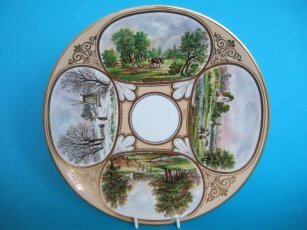 Although this plate is unmarked it is very similar to marked M. Mason 'replacements' and is made from an Ironstone type body. Measures 23cm. (9 inches) diameter. An interesting plate. No chips or cracks but there is considerable wear to the glaze and a little staining. Very good, no chips or cracks. 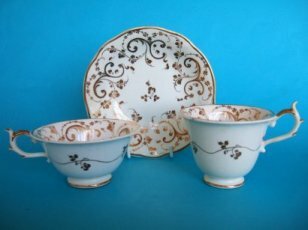 A very attractive and high quality Rockingham factory trio, teacup, coffee cup and saucer. The typical Rockingham neo-rococo shapes decorated with fine quality gilding with sets off the porcelain body superbly. The saucer marked with puce coloured factory mark and pattern number 1329, the cups marked with the pattern number only. Very good. Slight typical Rockingham fine crazing and slight discolouration to the handles. Only very light wear to the gilding.